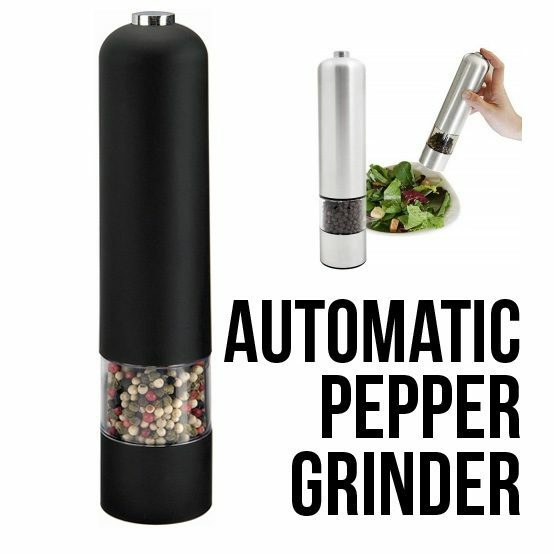 FREE Deluxe Automatic Salt or Pepper Grinder with Ingredient Window and LED Light! Down From $35.00! You are here: Home / Great Deals / FREE Deluxe Automatic Salt or Pepper Grinder with Ingredient Window and LED Light! Down From $35.00! 13 Deals has this Deluxe Automatic Salt or Pepper Grinder with Ingredient Window and LED Light for FREE (Reg. $35.00)! Just pay shipping and handling! When you’re up to your elbows in hot ingredients, it’s nice to have the one-handed convenience of the Deluxe Automatic Pepper Mill. With a simple push of the button, the sturdy ceramic grinder produces freshly ground sea salt or pepper. With a simple twist, the electric peppermill’s grind level can be adjusted from fine to coarse. An LED light located at the bottom of this device illuminates your dish and helps with accurate portion control at night. The Transparent window lets you easily gauge when a refill is needed. The Automatic Pepper Mill Grinder is ideal for salads, steaks, and other meals that taste better with fresh-ground pepper and sea salt.